It is that time of the year again! The summer sun is calling your name, and it is time to begin daydreaming about barbecues, family vacations and spending long days at your favorite places. The time has come to let loose and enjoy what is arguably the most fun season: summer. Military spouses and Veterans know the importance of making the most out of free days, especially during the summer break when your kids are home from school and the family can enjoy time together. How do you make sure that summer does not pass you by without having many days of fun with your family? 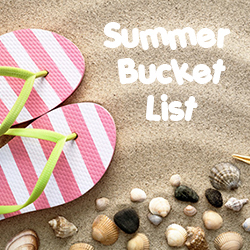 Make the most of your summer by creating a bucket list for you and the kids. A bucket list is a great way to ensure that the days do not pass without a purpose. Working towards completing each activity is fun, easy to document by taking pictures or writing journal entries, and will surely produce memories that you will cherish forever. Here are some great summer bucket list ideas for you and the kids. Drive-in theaters were once becoming endangered in the United States, but their popularity is on the rise again. If you have one near your town, pack up the car and enjoy. If not, how about building your own outdoor theater ? The experience is one that your kids will never forget. Summer is the perfect time for some splash-tastic fun. Water balloon Pinatas will surely fill your day with smiles while also providing a little relief from the heat. Get some large balloons, fill them carefully with water from the garden hose. Use heavy duty string to secure them to a clothesline, monkey bars or tree branch. Take turns swatting them with a plastic whiffle ball bat. The burst of cool water will have everyone squealing and giggling. Fire pits are all the rage this summer. And where better to have a S’More filled summer night, then sitting around a fire pit. Sing and dance to your favorite music and have the time of your life enjoying this simple activity with your best friends and family. You’ll just need a bag of marshmallows, box of graham crackers, a couple of bars of breakable chocolate (or a bunch of miniature bars), a long stick, and a flame. Visit our Summer Bucket List Pinterest board for ideas on building a DIY fire pit for under $20. The stars look incredible during the warm months of summer. No need for a telescope on a clear summer night. Grab a blanket or lawn chairs and find the perfect spot to start gazing. Print a map of the constellations for everyone in the group. Give out prizes to the first watchful eye to spot a meteor shoot by. And another for spotting the star clouds of the Milky Way or lights of the Summer Triangle. Taking a trip to the beach this summer and make your own adventure as you and the family hunt for a shark’s tooth. It’s best to hunt at low tide. Start your hunt by walking along the tide lines, sandbars or water’s edge. Look for little dark colored triangle shaped teeth amongst the shells and debris. They can hard to spot, but oh how rewarding they are to find! For an outing that is fun and unexpected, take the family on an evening picnic at the beach or park. Check the exact time the sun will be setting that day and make sure to get there at least an hour before. Pack up the picnic basics the night before: large blanket, bug spray, and basket to fill with kid-friendly fun food and drinks. Reading is a great way to relax and stay entertained. Make completing a good book a part of your bucket list this summer. Not sure what to read? there are plenty of Free summer reading programs available online. Kids and parents who join, record their reading time online to earn rewards and prizes. It is hard to get the kids to stop and spend quality time with the family these days, but there is no better way to accomplish this task than taking a road trip. Even if you do not have kids, summer road trips provide an exciting way to spend a day — or ten. Follow Martinsburg College’s board MC | Summer Bucket List on Pinterest.